I am home for a few more days, O’s team won their game last night in an 18-9 win, the girls played well and O had a three RBI double up the middle in her second at bat. It was a great hit at the right time and the other team never got any closer. She also played well in the field. The team plays for the championship Saturday morning and afterwards, we’ll load up and head back to the lake for the rest of summer. I love summer; it doesn’t get any better. 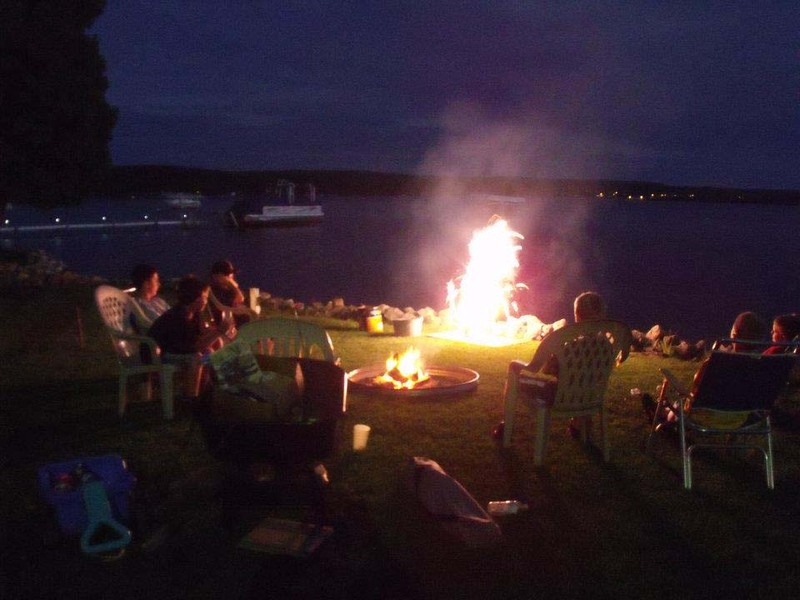 a summer campfire by the lake – kids, fireworks, laughing and ‘living large;’ it doesn’t get any better! I realize I live in a unique world, the world of school where learning is important and growing is even more important. The folks who don’t teach, don’t understand, or simply don’t get it. They argue that teachers don’t get it, either; but I do. You see before I became a teacher, I worked and I had a job in the private sector. I worked for a restaurant company and after thirteen years, I had three weeks of vacation. I had a flexible schedule and could take a weekend off or ‘make’ a three-day weekend when I needed one. Then I decided I wanted more and I quit my job and went back to school. W came along that first year in school, I student taught, I waited tables and we made ends meet, I graduated, found a teaching job and have been teaching ever since. I would like to believe I’ve been teaching my entire life, but I’ve been doing so professionally, since 1999. It sounds like a fairy tale or good luck, but it isn’t; it came from hard work and doing what needed to be done, when it needed to be done. I have learned, after thirteen years, teaching isn’t easy and kids don’t necessarily understand (or accept) why they are in school, so I need to teach a bit differently to every kid, because they don’t all learn the same way. It might have to do with the grade level I teach, seventh grade, where kids are grappling with themselves and growing socially, emotionally, physically, and intellectually all at different rates and times. Some kids take school at face value and do it because it is what they were told to do and challenging authority is not part of their makeup, yet. Some kids try to cheat the system and take short cuts and only want to learn what is on the test so they can get a good grade, and some kids just have to learn it the old-fashioned way – the hard way, where experience is the teacher. I don’t know what kind of student you were, but the best students are a combination of all three, I definitely learned the hard way and experience has taught me there are no shortcuts, only short ways back to where I was in the first place. So, it is a lot easier to work hard, do the reading, answer the questions, and use a strategy to use what I am learning in a different way. Because school isn’t about getting good grades and getting it done, it is about learning ways to solve the problems that come your way after school and using what you learned to get ahead. So far, I am keeping up. I have been reading and I swam the mile. I have lost a little bit of weight and I feel a bit better, but I have a long way to go and many habits to break. Every summer is a little bit different and experience has taught me I need to work harder and stay focused on my goals. Right now, O is sleeping upstairs, the water is running and the plants are getting a good drink, the birds are playing in the sprinklers, Ivy is looking and dreaming out the window, and I’m writing about learning and applying what I’ve learned. I learn through hard work and stories. Sometimes the stories are written, some are told, and some are visual. Often it’s a movie with a great theme or sometimes it is a commercial like the ones produced by the Foundation for Better Life, and sometimes it’s just a great commercial. I love football and I am sad when the Super Bowl comes along because it means the season is over until next year. It also means the Super Bowl advertisements will be on and even though some of the ads are very ridiculous ads, it is all about consumerism – buying more because it is cool. However, occasionally there is ad that resonates with me and I want to figure a way to use it as a teaching tool, sometimes I can and other times I have to wait for the right moment. Now is the right moment, this year Chrysler produced an ad for the super bowl and it is called ‘Halftime in America’ and it aired at the end of halftime, just as the third quarter was about to begin. I am certain a few people missed it, but it caused quite a furor – right wingers called it an Obama ad, left-wingers called it a right wing ad, but it was simply an ad for a car company and it pulled at our emotions. Narrated by Clint Eastwood in his gravelly voice, the ad asks the viewer to think of how America and Americans have endured, grown, and overcome adversity. At the time, the score was 10-9 Patriots leading the Giants. The commercial alluded to the struggles America has endured over the past decade – unemployment, permanent loss of manufacturing jobs, malaise, and loss of ‘American prestige’ at home and abroad. The message was simple, after much adversity Chrysler and Detroit are making a comeback and are going to better than ever. It’s a wonderful commercial, two minutes long and finishes with Clint speaking to us all; “Yeah, it’s halftime, America, and our second half is about to begin.” Watch for yourself. Well, my second half is about to begin, too. Today is the figurative final play of the first half and tomorrow, the kickoff of the second half of my summer. My second half is gonna be a great one and today is gonna be a great day, I know it. So, I’d better jump up, jump in, and seize the day, today is gonna be a great day! Making the Days Count, one day at a time. What do you remember about a comeback in your life? What did it teach you? What have you tried to pass on to others? My seventh grade math teacher took my Sports Illustrated magazine and NEVER gave it back, ruining seventh grade math for me, I didn’t recover until 11th grade. Hi, nice post. I’m here because Susie sent me, LOL! I get it too! Don’t teach, but while my kids were in school, ran bake sales, then scrip sales, then school festival fundraisers, coordinated volunteers, graduated to running local option levies and chairing the local school funding foundation BECAUSE I worship in the house of Education, and bow to teachers. Lucky B.O.W in your house to have you around. Suzy sent me and I’m glad she did. Happy summer. Hello to the birds playing in your sprinklers. Thanks for stopping by and thank you for all of your hard work to support me and other teachers in the classroom, my school has a very active parent-teacher organization and I feel incredibly supported and appreciated by them, life would terribly bleak without their support! Thanks! I too, I stopped by Susie’s place today and a few weeks ago, I read her post about her dad and advertising. have a great day and keep making your days count! thanks for stopping by – I’m working on a camp letter to Tech, I hope it’s not too late…. enjoy your summer and I hope you stay in the classroom, your students would be missing an education! I love how you organize your summer. I hope the second half is going well! I wish my kids teachers looked for other ways to teach like you do! They are both in college, but I have a theory about why we lag in math. Its the books. Where are the equations? I think they should reprint the old ones (that had 30 names in them) from the 1960’s and 70’s! LOL! thanks for the invite! I had to help my son with math this year – algebra he struggled – part of it is conceptual, the other part is hard work… and the last part was attitude which is related to hard work, but I’m working on it. I didn’t really get math until the end of my junior year when I aced the geometry final with a 98%. I have been accused of reading and blogging this summer – what else is gonna happen? but it is! 7th grade is when I went from hating math to loving it. This was partly because what “math” was changed (from the same arithmetic we’d been doing over and over for the previous six years to algebra) and partly because I had an amazing algebra teacher.